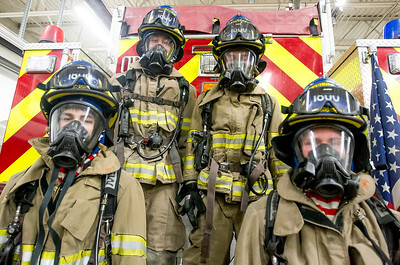 Sarah Nader - snader@shawmedia.com Alec Rusher 9left), 18, of Spring Grove, Morgan Fassnacht, 18, of Johnsburg, Mark Hohs, 18, of Spring Grove and Jackson Deehr, 16, of Johnsburg put on their gear for a portrait during their Explorer class at the Spring Grove Fire Station Tuesday, March 21, 2017. The program provides young men and women the opportunity to experience the fire and emergence medical services using hands-on and classroom training. Sarah Nader - snader@shawmedia.com Jackson Deehr (left), 16, of Johnsburg, Morgan Fassnacht, 18, of Johnsburg, Mark Hohs, 18, of Spring Grove, and Alec Rusher, 18, of Spring Grove pose for a portrait during their Explorer class at the Spring Grove Fire Station Tuesday, March 21, 2017. The program provides young men and women the opportunity to experience the fire and emergence medical services using hands-on and classroom training. 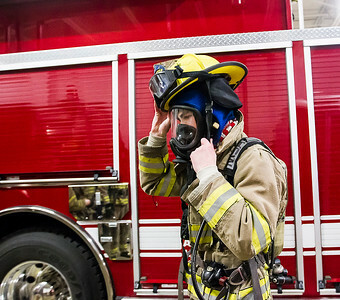 Sarah Nader - snader@shawmedia.com Jackson Deehr, 16, of Johnsburg puts on his gear for a portrait during his Explorer class at the Spring Grove Fire Station Tuesday, March 21, 2017. The program provides young men and women the opportunity to experience the fire and emergence medical services using hands-on and classroom training. Alec Rusher 9left), 18, of Spring Grove, Morgan Fassnacht, 18, of Johnsburg, Mark Hohs, 18, of Spring Grove and Jackson Deehr, 16, of Johnsburg put on their gear for a portrait during their Explorer class at the Spring Grove Fire Station Tuesday, March 21, 2017. 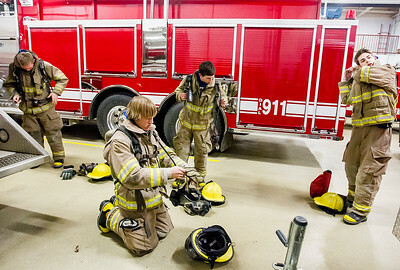 The program provides young men and women the opportunity to experience the fire and emergence medical services using hands-on and classroom training.